This is the easiest sparkler recipe and requires the fewest ingredients. The resulting sparkler won’t have quite the same effect as the kind you buy in stores, but you can dress it up a bit, if you like. Oh… and did I mention the sparks are purple? Yes, that is cool. Mix together the water, potassium nitrate, and sugar to dissolve the dry chemicals. Soak around 3 meters of yarn in the mixture. Arrange the yarn on a cookie sheet to make lines. You’ll be drying the mixture and then cutting the yarn to make straight stick shapes, so don’t worry about u-turns. Now you have two choices. You can either let the yarn dry on its own or you can use a relatively cool oven to dry the sparklers. If you have a bad habit of forgetting about frozen pizzas and turning them into cinders, just leave the cookie sheet in a dry place until the sticks are solid. 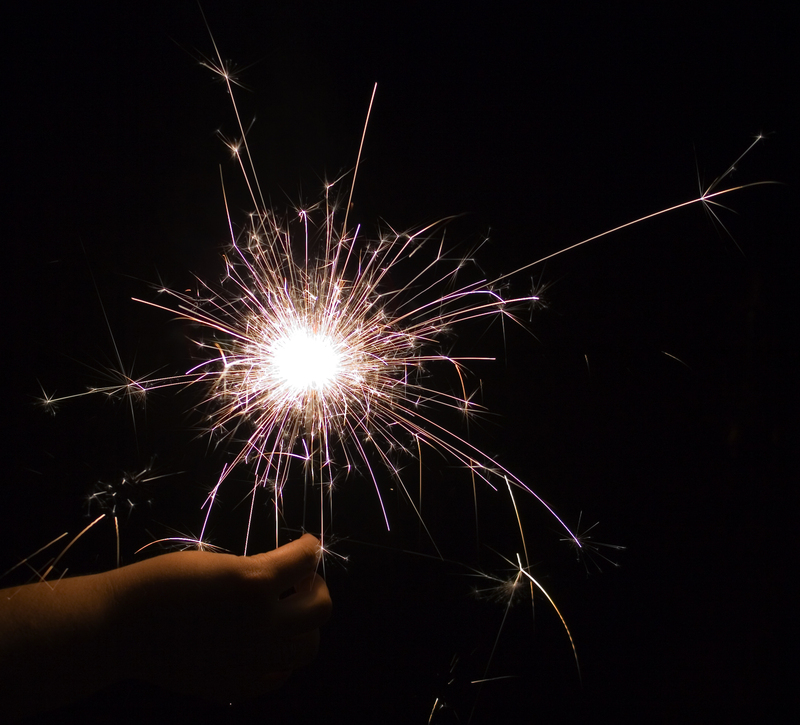 If you are capable of attending an oven, dry the homemade sparklers in a cool 300 °F (150 °C) for about 20 minutes, pulling them away from the pan after 5-10 minutes so they don’t stick too badly. If you dry the sparklers in the oven, but forget about them, eventually they will smoke (a lot) and catch fire! Once the string is dry and cool, use scissors to cut it into straight pieces. These are your sparklers. You can hold them in a gloved hand to light or use a clip, clothespin, or other device to keep from burning your fingers. This recipe is based on my smoke bomb tutorial. The sparkler produces a fair amount of smoke, but the sparks are decent in the dark. If you want more glowing sparks, you can add aluminum or titanium flakes to the recipe. 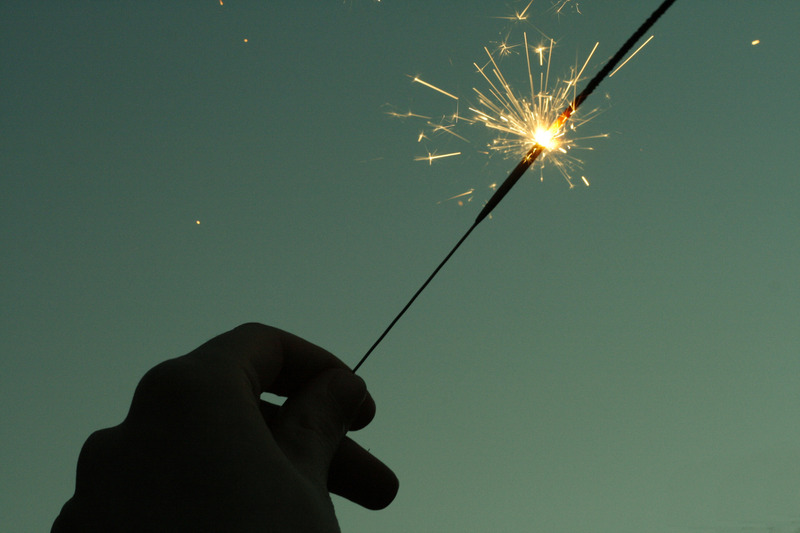 These homemade sparklers are like regular sparklers you buy. This recipe is distinctive in that it does not call for any potassium chlorate (an oxidizer which is hard to get shipped sometimes). Most of these chemicals you’ll need to order online. The sparks are reddish from the strontium salt in the mixture. Mix together all of the solid materials, except the dextrin. In a separate container, stir about 25 ml of alcohol solution into the dextrin to make a slurry or paste. Discard any lumps you can’t break up. Mix the dextrin paste in with your solid ingredients. You can add between 50 and 75 milliliters of alcohol to make a smooth mixture. Now you will coat your sparkler sticks or wires with the mixture. You have a couple of ways to do this. You can dip them into the mixture, leaving a few inches at the end of the stick to leave a place to hold the sparkler. Let the sparkler dry and then dip it again. Allow the sparkler to completely dry before use. Another method of coating the sticks is to pour the mixture into thin tubes (seal the bottom with tape or glue or whatever). You could roll paper tubes, use plastic tubing, etc. Insert the sticks into the mixture and remove them when dry (or not, if the tubes are paper). These sparklers take a bit to light. I recommend using a small butane torch or using a lit sparkler. Enjoy! I have loved receiving this Chemistry news letter!! I thnk it gets kids much more excited about science than what has been published in the last 30 years or so. I find get stuff from books that are pre-1970, and I get tired of baking soda and vinigar. I have had a blast with manythings from you with my students and look forward to sharing those with my grand kids as well. Thanks so much for the work you do! !